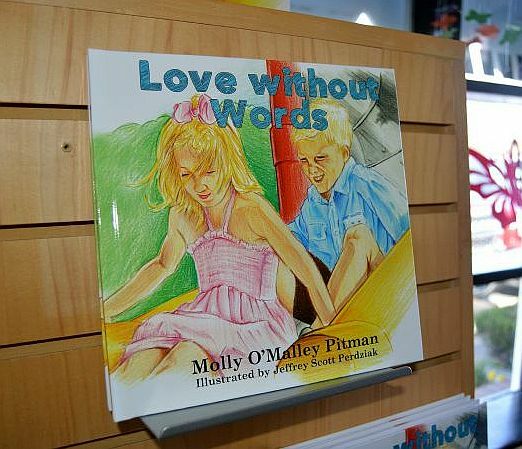 A wonderful collaboration of two Clarence residents, have produced an admirable new book called “Love without Words.” The book project was conceived and written by Molly O’Malley Pitman and illustrated by Jeff Perdziak. 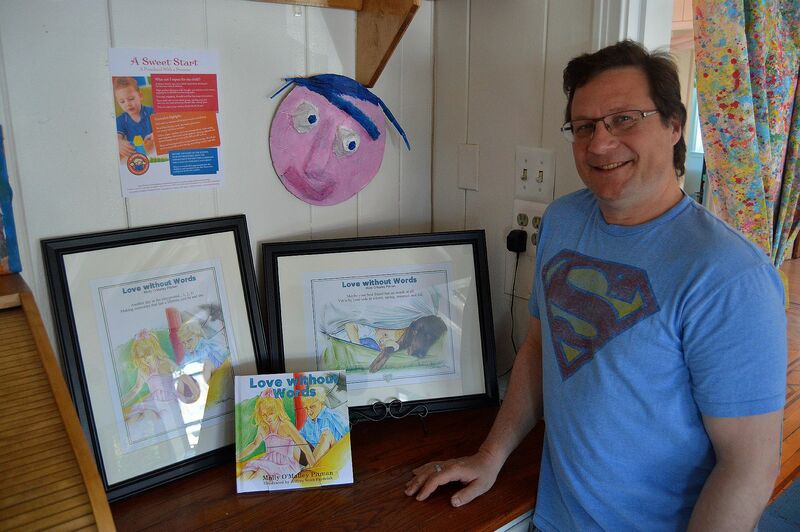 Ms. O’Malley Pitman is the owner of Sweet Charlottes (10255 Main Street) and Jeff is a Clarence artist who’s works are displayed at numerous locations in Clarence. Molly and her husband have two children Donovan and Charlotte. Donovan is 12 years old, but due to autism didn’t start talking until he was six years old. The idea for “Love without Words” came from how to explain Donovan’s uniqueness to the younger sibling Charlotte. Molly said, “When his younger sister Charlotte would say ‘I love you’ he would be unable to respond in a way it made sense to her. So I had to use real-life experiences to tell her ‘even though he can’t say he loves you, clearly he does. '” Molly gave examples to her daughter such as how the family dog can’t say “I love you,” but shows that emotion when the dog is happy to see you come home, or sits next to you. “You have to look for love in moments and memories we make with each other,” said Molly. The idea of writing a book about her experiences resided in Molly’s head for awhile, but were ignited when meeting author/publisher Kevin Blackley. Through their discussions about a possible book, Kevin and Molly knew that they needed strong images to convey the message.. She had previously interviewed other artists but eventually became familiar with Jeff Perdziak’s artwork. Jeff painted the railroad mural in Clarence Hollow, the Clarence Hollow Farmers Market murals, and the patio at Penny Lane Cafe. A few conversations were had and a collaboration began. “It was a challenge to find an illustrator because it had to be someone who understand my message and that the images would exude love,” said Molly. “Most of the projects I do are personal in nature,” said Jeff. “When I came into talk to Molly, I could feel the emotions and that’s when I’m at my best in creating.” Jeff also explained that it was an interesting process seeing these family photos woven into the concept of a book. Jeff said that he was in constant communication with Molly when creating the drawings, because he wanted to make sure that the ‘feeling’ was present in the images. The result of their idea, hard work and talent is a nice 40-page book that has value to readers young and old. The book was written from the experience of Donovan’s autism, but the theme can be applied to countless situations in anyone’s life. 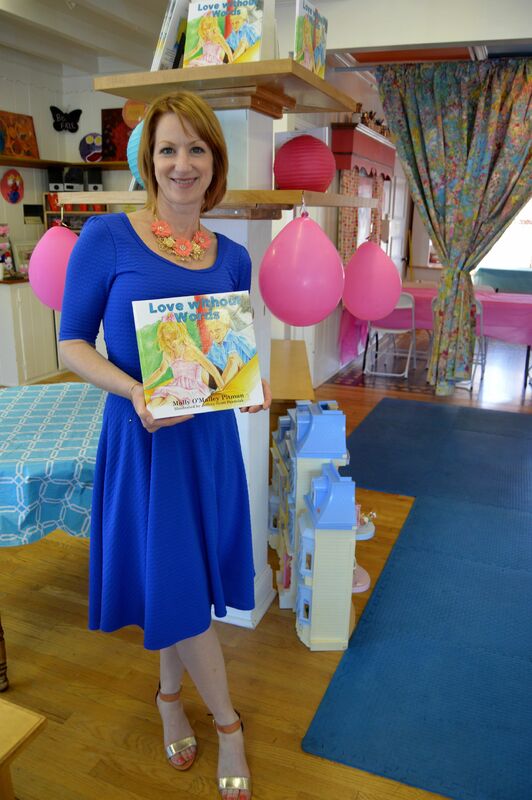 “Love without Words” is available at Sweet Charlottes and online at Amazon. Every book sold, a donation will be made to organizations supporting families with affected by autism. Previous Previous post: Photos: Sunday’s Bike Swap a big Success!